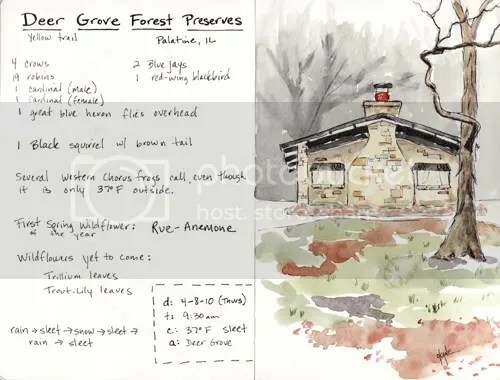 Deer Grove Forest Preserves – Let's Paint Nature! Today I had the chance to hike at Deer Grove Forest Preserves in Palatine, IL. This preserve is a part of the Cook County Forest Preserve Trail System. It consists of about 9 miles of tails, some paved, most not paved. It is surely beautiful. “I step out onto the yellow trail. It consists of white gravel so my steps are very loud, there is no sneaking up on the wildlife today. I spot many wildflowers soon to be: trout-lily leaves and trillium leaves are abundant. Holy cow, I see my first actual wildflower of the year – Rue-Anemone. How delicate but strong this species must be to endure this cold, harsh weather. Spring at its meanest. Many crows are “cawing”, several are in a mowed grass field pecking at the ground. When 19 robins graze for worms in the same area, one single crow flies overhead, pretends to make a nose-dive at the robins, and the robins suddenly clear from the area. More field for the crows, that’s using your bird brain! I hope you enjoyed our adventures in Deer Grove. God’s miracles are not just for me to enjoy but for everyone to enjoy. Lana: Thanks! Yes, yuck to only 37°F. What crazy weather we have, I’m programed not to get use to anything, but adapt to change.